I had the alarm set for 7:15. It was very grey outside, temperature was 37*. I had plenty of time for a shower before Liz brought breakfast at 8 (cheese omelet, bacon & grape juice). An announcement was made at 8:45; clearing the ship was going to take longer than expected. Talking with crewmembers later, they stated that this was typical for the Chinese officials. We were told to go to the Galaxy Lounge on deck 6, all the way forward. I walked to the forward elevators to go up; but when the doors opened there was nowhere to go. The elevator lobby was packed; I couldn’t get off. So, I went down to 5 to wait it out in the Crystal Cove. When I got there & looked up, I could see what the problem was. With the gangway on 6 midship, hundreds were already lined up on both sides of the the atrium trying to merge & be the first ones out the door. They must have gotten tired of waiting in the Galaxy; & they started toward midship. The line was backed up all the way to the forward elevators; & that’s why I couldn’t get off when the elevator went up. Hmmmmm. We’ve all been assigned certain buses; & the buses are only supposed to be half filled; so what’s the hurry? All but approximately 80 passengers were taking the overland trip. I did get a chance to say goodbye to Gaye one more time. Debbie wasn’t able to go into Beijing due to a visa problem. She & Gaye were going to do their own thing in Tianjin until time for Gaye to fly back to Cape Town tomorrow. At 9:30 there still had been no announcement made; but I could see that the line was moving a bit, so we must be ‘clear’. Once I hit the door, the cold air almost took my breath away. I made a quick dash to bus #3. I was pleased when I realized that my bus mates would be Rick (Cruise Director), Mama Lee (to refresh your memory....she lives aboard the Serenity), my bridge friend Dwight Maxwell, Rex Mincheff (who’s nearly crippled with osteoporosis but manages to keep up with everybody), John McKinnon (who was traveling with & taking very good care of his elderly mother), David Awalt (the gentleman who dances around by himself & cheered at the Olympics with a megaphone), Raphael Derkson (the Galaxy Orchestra Music Director) & Jeff Walters (the World Cruise Videographer). The rest of the passengers were people I’d seen many times; but didn’t know them by name. Our Guide was a lovely woman named Joy; & her assistant was Rose. The buses looked brand new, were extremely comfortable; & being half filled, there was plenty of room to stretch out. I made my nest a few rows from the back. Joy must have sensed that most of us were tired; therefore, she only talked for a short while after we left the port area of Tianjin. Jeff had taken the whole back row for his video equipment; & he was soon fast asleep in the fetal position. Raphael was snoozing across from me; Rick snoozing in front of Raphael. It was so quiet, I started to doze off. By now all the other buses had long since passed us on their way into Beijing. Rick was consulting with Joy about a backup plan. They decided to call one of the other bus drivers to ask them to hold back & follow us in case we had further problems. Good thing the buses were only half full; we could have hitched a ride if need be. We were scheduled to make a ‘happy stop’ along the way; we just took ours a little early. The driver stopped at a truck stop. Not exactly a classy pit stop; but they did have the manpower & tools to get us back on the road. Again several of the guys got out to supervise the operation. We all gasped when we saw the tire that they took off. It had 2 large holes in it; the largest about 12” long x 3” wide. We were supposed to be comforted by the fact that the tire was the type that would not go flat. Twenty minutes later, we’re back on the road. Most of us dozed off again, only to be awakened when Joy told us that we would be coming into the city soon. Again I found myself mesmerized by the architecture. Ultra modern mid- & high-rise buildings in all colors & shapes. Green, blue, bronze reflective glass windows; curved, arched, pyramid, spherical, wavy, free-form. It was just insane! The highways were 10 lanes wide, packed with vehicles. At 12:30 we reached the Grand Hotel Beijing, where we were served a lunch buffet in the gorgeous atrium ballroom. The other buses had arrived earlier; & most everyone was nearly through eating by the time we arrived. Beautiful round tables & chairs draped in white satin; two very long tables of Chinese & western dishes. I sampled quite a few things; but the most noteworthy was the pan fried sole with caper sauce, jumbo fried prawns, cucumber/hearts of palm salad & a spicy konjac salad. I didn’t find out until later that konjac is actually a tuber (think turnip-like); that when cut into thin strips, resembles spaghetti noodles. It’s very high in fiber; & is often used in lieu of spaghetti for weight loss. Who knew that something so tasty could actually be good for you? I got quite a kick out of watching Rick fill his plate. He was eating like an athlete in training......loading up on carbs. He started with spaghetti & rice; more spaghetti & cake. How does he keep that trim physique??? We left the hotel a little before 2pm & headed toward the Forbidden City. Joy handed each of us our own little radio receiver so that we could hear her narration (via bluetooth microphone). She also said that we should try to stick together because we could easily get separated from the group in the vast crowds. She told us that she would give us a verbal warning (by saying ‘sticky rice’) if any one of us started to stray too far. I was not prepared for just how ginormous the Forbidden City grounds would be. There are supposedly 980 buildings behind these walls; & construction started in 1406 (completed during the Ming & Qing Dynasties). It would be futile trying to describe the route we took through the compound; so a diagram would be in order. We entered through "A"; & came out behind "H". There were hundreds of us trying to merge into a 6-7’ wide opening at the Meridian Gate. Once we stepped inside we were in what is known as the Outer Court. It was a HUGE square with a series of ornate marble railings & footbridges over the (narrow) Inner Golden River leading to the Gate of Supreme Harmony. I could hear rumblings right away; Joy was so short that we couldn't see the "Group #3" sign she was holding. If we can't see that sign at all times, then we'll be hopelessly lost. Dwight & Raphael to the rescue. They're fairly tall; & agreed to take turns holding the sign so we could stay together (like 'sticky rice'). Along the roofline of the gate building were horizontal panels covered with colorful designs in enamel & painted in gold leaf. The underside of the eaves had such intricate details, it’s impossible to describe. There were rows of rounded ‘ribs’ supporting the overhanging roof; & on the end of each ‘rib’, an ‘evil eye’ symbol had been painted. One could study all this detail for hours & hours & not be able to take it all in. The stairway that took you up to the gate itself was divided into 3 sections. The two outer set of steps were built in modern times because the original steps in the center were so worn & starting to crumble. In the center was one long slab of marble cut in bas relief (200 tons) with a set of narrow steps on either side. On either side of the stairs were large bronze lion statues. Joy went into great detail about the history & the significance of each & every feature of all the buildings. I was listening; but mostly wandering several yards away taking photographs from various angles. Every once in awhile, I’d hear the words ‘sticky rice’ which meant one of us (probably me) was a little too far afield. 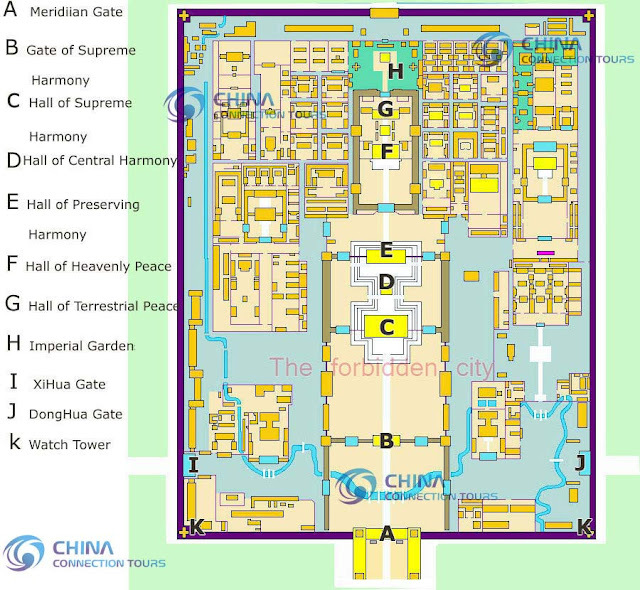 Once through the gate, the very impressive Hall of Supreme Harmony loomed across the wide expanse of Taihedian Square. Its elevation, atop 3 tiers of marble terraces, gave me some idea of its importance. Adorning those terraces were statues, such as bronze cranes & tortoises, a marble sundial, a Jialiang (type of measuring device) & many gilded bronze vats that collected rainwater that could be used in the event of a fire. Behind this building was the much smaller Hall of Central Harmony. And just behind there was the Hall of Preserved Harmony. I noticed that the colors of the paint & enamel were quite faded. I wondered why; but failed to ask. The building also had a larger marble bas relief slab adjacent to its steps (approximately 250 tons). We then proceeded through the Gate of Heavenly Purity. 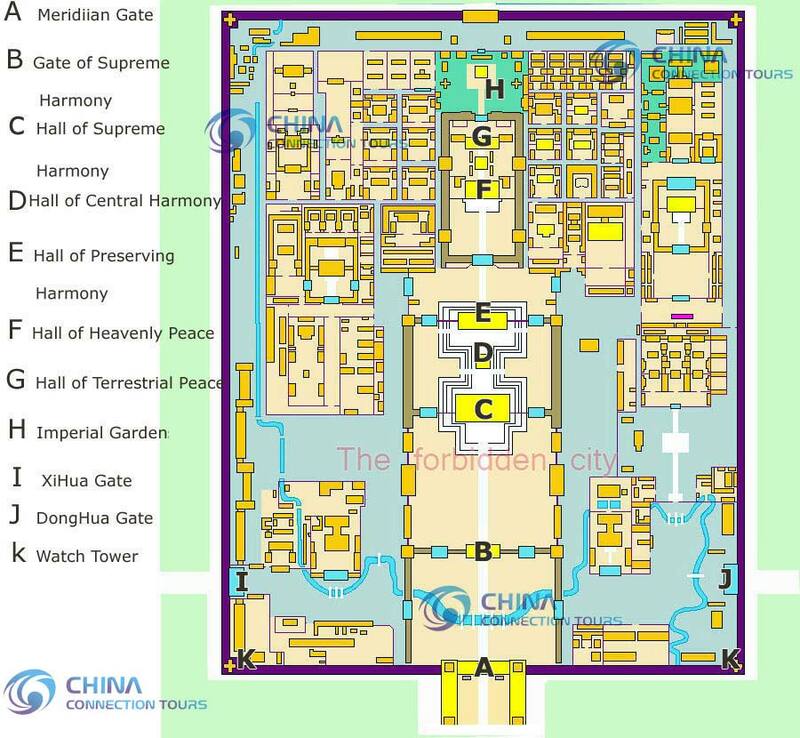 This divides the Outer Court from the Inner Court, where you’ll find the residences of those who lived within the Imperial City. Each building within the Inner Court was truly ornate & varied greatly in size. Continuing our walk from south to north, we came upon the Palace of Heavenly Peace, Palace of Union & Peace, & the Palace of Earthly Tranquility. Joy steered us to a small alley where we could get a closer look (through walls of glass) of the Palace of the Queen Consort. The contents had been carefully preserved & placed exactly as it was back in the Qing dynasty. We finally worked our way out of the maze of alleys & buildings into the Imperial Garden. Surprising that it was not a garden of colorful blooms; but a narrow walkway of exotic (& oddly shaped) trees & rock formations. The walkway was fashioned of marble blocks & slabs laid in geometric patterns & accented with ‘stripes’ of tiny pebbles mortared into more geometric patterns. Very simple by modern standards; yet very impressive & beautiful coming from the 14th century. There were a few smaller ornate buildings toward the back of the Imperial Garden. The most unique was the Pavilion of 10,000 Springs. At last we made our way out through the north gate (Gate of Divine Might). Just a short distance further north, I could see a beautiful 3 tiered pagoda style building. I was told that it was the Wanchun Pavilion atop Prospect Hill in Jingshan Park. There were long lines of people waiting to get in; & a large group of vendors that were blocking our path to the waiting bus. They were very aggressive. It felt so good to sit down after more than 2 hours of noise & dodging pedestrian traffic. No time to rest as our next stop was right ‘around the corner’ at Tiananmen Square. Tiananmen is the largest central square in the world. This immense concrete courtyard is surrounded by Beijing’s most important attractions. On the east side of the square is the National Museum of China. On the west side is the Great Hall of the People, built just over 50 years ago. In addition to being the home of the National People’s Congress, it also hosts many diplomatic activities. In fact, the 2nd floor banquet hall will be the setting for tomorrow night’s Crystal Banquet. On the north side is Tiananmen Tower (built in 1417), which at one time served as the front entrance to the Forbidden City. On the south side of the square is the Memorial Hall of Chairman Mao. His body lies in a crystal coffin in one of the three halls. Smack dab in the middle of Tiananmen Sq. is the Monument to People’s Heroes. Built in 1952, it is the largest monument in China. A much more recent addition is the installation of 2 jumbotron screens next to the monument. At this point, I was pooped; it had turned very cold; & I wasn’t enticed to dodge cars crossing a busy street to look at concrete (no matter how important it may be). So, several of us chose to stay on the bus (parked across the street in front of the People’s Cultural Palace). It was a relaxing half hour of people watching. Seems like every 5 minutes or so a troop of uniformed soldiers would parade from east to west as if on sentry duty. When everyone returned to the bus, they were saying a cold wind had whipped up. I think everybody was DONE for today. It was finally time to head for the China World Hotel; check in, have dinner & get some much needed rest after such a long, tiring day. Since this day was so jammed with information & photos, I will pause the story; & save the rest of tonight’s events for tomorrow’s entry. Gee......I wonder what everybody else is doing back on the Serenity? Let me add to the chorus of thank yous for your wonderful blog--it's really the BEST!! I'll be doing some of the same ports next year and definitely feel better prepared thanks to it (ditto your Antarctica trip). Do you recall about how cold it was? I imagine it was especially hard for you since you hadn't originally intended to stay on. Thank you, R, for the kind words. As for the rest of the trip, temps through South Korea & Japan ranged from upper 30's in the mornings to the 50's during the day. 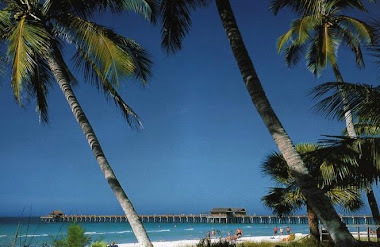 There were times when those 50's felt much colder if it was windy & cloudy. Decidedly colder the closer we got to AK. Highs ranged from mid 30's to low 40's in AK & Canada. Had a few snowy days as well. I was able to layer sweaters under the W.C. windbreaker they gave us. A few times I borrowed boots & wooly head covers from a friend. I'm kinda hot natured anyway; so it was doable. It looks like Crystal out did themselves on this excursion! Amazing hotel. Thanks so much!